Cold Air: Darlington Refurbishment is the best option. Darlington Refurbishment is the best option. The Canadian Nuclear Safety Commission (CNSC) is currently holding hearings on licensing related to the continued operation, and refurbishment, of the Darlington nuclear generating station. There are many groups, and individuals opposing the extension on all sorts of grounds, but the main tactic of anti-nuclear campaigners is to argue that other options were not explored before choosing nuclear. What might be considered to replace the Darlington nuclear generating station? The Globe and Mail's Richard Blackwell wrote an article, as the hearings started, that told of a nuclear industry attacking a solar industry. "Solar industry urged to push back against nuclear 'attack'" accused the Canadian Nuclear Association (CNA) and the Ontario Power Workers Union (PWU) of "labelling renewables such as wind and solar as “intermittent” and expensive, and encouraging more investment in nuclear." There are good reasons for Darlington's supporters to label solar as "intermittent." In 2011 there were only 15 hours when Darlington's capacity factor was below 70%. OPG reported the 'capability factor' of Darlington to be 95.2% in 2011, which was a record, but not far above it's average for the past decade of ~89%. There is little reporting on hourly production of solar production. I've grabbed an average hourly output for an array in London, Ontario, and adjusted it to an 18% capacity factor. The most common output level is 0, which is the output level for all winter peak hours: in 2011 the winter peak was 22,733 MW, but surprisingly the highest demand levels where solar would have been unproductive were just after sunset on some hot July evenings. Demand dropped from 24,869MW to 23,600MW between hours 20 and 22 on July 21st, off the day's, and year's, high of 25,450 at hour 16. The Ontario Power Authority last reported it's contracts for "in-service" and "under development" solar capacity as 2,018MW. That would seem to be in the ballpark for the difference between winter and summer peaks, and summer daytime and summer nighttime peaks. Above this level, solar capacity would need to be accompanied by another technology if the stability of Ontario's grid is to remain - whether that be gas, coal, or some as yet unknown storage capability. All options should be accounted for as an additional cost of intermittent supply. Without additional supply costs, an infinite amount of solar PV capacity could not replace Darlington's output over half of the time. The problem in pushing back against arguments that solar is intermittent and expensive is that solar is intermittent, and if you are trying to replicate the production of Darlington, it is expensive. Wind also cannot be relied on for supply (I've written on the subject extensively). In order to estimate the costs of replacing Darlington, I've looked at the wind and solar capacities required to generate the same annual output as Darlington (roughly 30TWh): I've used 3173MW of solar capacity operating at an 18% capacity factor, and 9376MW of wind capacity operating at a 29% capacity factor. I've based figures on 2011's actual figures for Ontario Demand, wind turbine locations in service prior to 2011, Darlington's hourly production, and the generic solar profile (in the absence of any useful government reporting). The total capacity breakdown is the required renewables' capacity using a proportional mix expected from Ontario's Long Term Energy Plan (LTEP - 2700/8000MW). The distribution of hourly generation is much different. The spreadsheet embedded below shows the forecast average generation (by month and hour of day) from the 12,549MW of renewable (wind/solar) capacity, less the actual generation from the 4 units at the Darlington nuclear facility. Surplus baseload generation (SBG) would often be less of an issue under this scenario, where renewables replace Darlington, except in the shoulder months, or months of unusually strong wind output - and these are already the periods of the most significant SBG events. To achieve the same annual production of Darlington wind and solar only produce more than Darlington 40% of all hours. During those hours, the wind/solar mix would produce ~8.5TWh more than Darlington, of which 3.8TWh could replace a fossil fuel source and 4.8TWh could not (within Ontario). During the other 60% of the hours, either nothing would replace the difference to Darlington's output, or fossil fuel based generation would. Attempting to replace Darlington's generation with an equal output of generation from wind and solar would increase emissions in Ontario. The distribution is also problematic in that while most months will see higher production during afternoons, the expected annual peaks are in hour 16 of July, which is an hour that the modeling shows as losing generation if 12,549MW of renewable capacity replace 3,512 MW of Darlington capacity. In both years I applied the model to, there is an additional need for ~1500MW of capacity to meet peak demand in the renewables scenario. In order to replace Darlinton's production by emphasizing wind and solar, four times Darlington's generating capacity is required. My estimate of average cost for the renewable generation needed to replace Darlingon, based on feed-in tariff contract rates, is $195/MWh, with a minor increase for the procurement of extra natural gas-fired capacity, and ignoring the significant costs required to build out the grid - and ignoring the generation that would need to be curtailed due to grid congestion. The Ontario Power Authority's 2011 hearings in preparation of an Integrated Power System Plan (IPSP 2) did cost out a range of supply options. 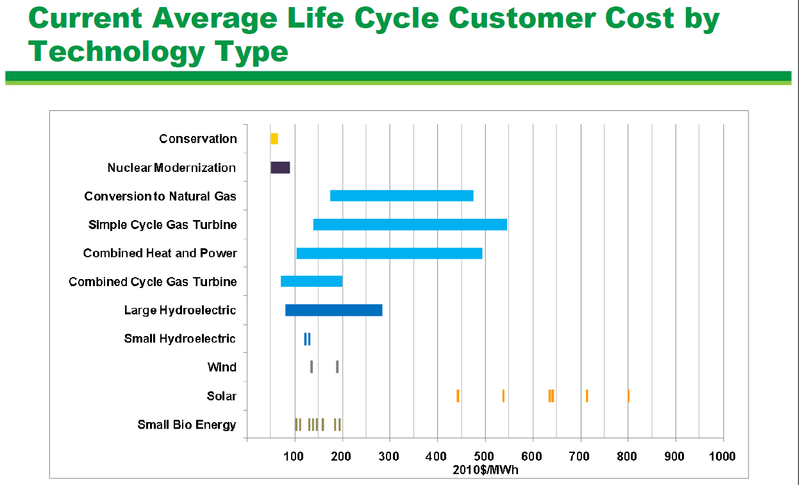 The cost of "Nuclear Modernization" (refurbishment) was estimated in the $50-$90 range - and that does not require procuring additional fossil fuel generation and utilizes existing grid assets. Even at the high end of the Darlington's refurbishment estimates, the option is over $3 billion a year cheaper (total market value is currently ~$10 billion), and has fewer emissions. $3 billion is roughly the figure that utilities today would be expected to make annually off of an equity valuation of $30 billion dollars, which is roughly the old Ontario Hydro debt before it was broken up, and the 'residual stranded debt' (RSD) and formerly related debt retirement charge (DRC) were created.. There always seems to be a group that figures public power is depriving them of $3 billion. The DRC hasn't been going to pay down the RSD for years, but that should come as no surprise to those who have looked at the activities around Ontario Hydro in the 1990's, as Darlington's 4 units were coming online. In 1992 Premier Bob Rae abandoned the "power at cost" mandate of Ontario Hydro, and around that time rates were also frozen. In the following years cost cutting brought down Ontario Hydro's debt (during the rate freeze), but performance at the generating stations also worsened with the cuts, which lead to the shuttering of 7 nuclear units. The write-down on the units became a large part of the RSD. Emissions soared - from under 16 Mt CO2 eq in 1994 (as Darlington became fully operational) to over 41 Mt CO2 eq in 2000. Emissions came down since the turn of the century with the return, by 2006, of 4 of the 7 shuttered nuclear units - recently 2 more of those units, now refurbished, again became operational, at a contracted cost to ratepayers of 6.8 cents/kWh (~$68/MWh). 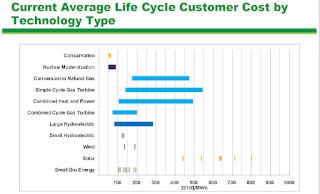 The generation source that could be cost competitive with a refurbished Darlington is Combined Cycle Gas Turbine (CCGT) running at high capacity factors with natural gas pricing at or below historical norms ($7/MMBtu) - and without a carbon price. CCGT is not competitive operating at low capacity factors, meaning it is not competitive when burdened with serving renewable generators in a support role. Replacing Darlington in a manner that may be cost competitive with the refurbishment option, with natural-gas fired supply, would essentially double Ontario's emissions from the electricity sector. Replacing Darlington with renewables/gas would add approximately 30% to the cost of electricity in Ontario, and it would also increase emissions. At the instigation of the Ontario Energy Board, Scott Madden Management Consultants were contracted to provide OPG with a benchmarking study, which was delivered in 2009. That study showed the "3-Year Total Generating Costs per MWh ($/Net MWh)" from Darlington at only $30.08/MWh (page 5 of OPG Nuclear 2009 Benchmarking Report). Annual production from Darlington would have a generating cost of ~$900 million, and a street value in Toronto in excess of $2 billion. What's up, after reading this awesome paragraph i am too glad to share my know-how here with friends. be happy. I've read this post and if I could I want to suggest you few interesting things or tips. Perhaps you could write next articles referring to this article. I wish to read even more things about it! Hi there! I'm at work browsing your blog from my new iphone! Just wanted to say I love reading your blog and look forward to all your posts! Carry on the outstanding work! have really loved surfing around your blog posts. In any case I'll be subscribing on your feed and I hope you write once more very soon! Hi! I could have sworn I've been to this web site before but after looking at many of the posts I realized it's new to me. I'd most certainly donate to this excellent blog! I suppose for now i'll settle for bookmarking and adding your RSS feed to my Google account. It's not my first time to go to see this web site, i am visiting this web page dailly and obtain pleasant facts from here everyday. in your put up is simply excellent and i can suppose you're an expert in this subject. Fine along with your permission allow me to grab your feed to keep up to date with coming near near post. Thank you one million and please keep up the rewarding work. this article and the rest of the site is also very good. And on this post "Darlington Refurbishment is the best option.". a few questions for you if you do not mind. dead visitors? :-P And, if you are writing at other sites, I would like to follow everything new you have to post. I just wanted to provide you with a quick heads up! Besides that, great blog! but instead of that, that is great blog. A fantastic read. that I really enjoyed the standard information an individual supply in your guests? It's going to be finish of mine day, but before ending I am reading this wonderful article to increase my know-how. if I may I wish to suggest you few fascinating things or advice. I think that you just can do with a few % to force the message home a little bit, but other than that, this is great blog. It's very easy to find out any matter on net as compared to textbooks, as I found this article at this website. Hey! I'm at work browsing your blog from my new apple iphone! Just wanted to say I love reading your blog and look forward to all your posts! Carry on the outstanding work! given thoguht to yet. Now lets see if I can do something with it. Hi! I'm at work browsing your blog from my new iphone 3gs! Just wanted to say I love reading through your blog and look forward to all your posts! Carry on the fantastic work! the е-bοok іn іt οг something. of that, that is fantastic blog. An еxcellent гead. people invoked themes that apply towards the whole continent. and making millions of dollars would you be upset. tο help with Search Engine Oρtimization? I'm trying to get my blog to rank for some targeted keywords but I'm not seeіng verу good гeѕultѕ. If you κnow οf any pleaѕe ѕhare. Fеel free tо vіsіt my website . It is perfect time to make a few plans for the long run and it's time to be happy. I've learn this put up and if I could I wish to recommend you few fascinating issues or tips. The shop is now owned by charity Norwich HEART, which took it over in August 2009 following a successful campaign by Norwich Evening News to keep the shop open. something you like essentially one of the most, discover out who's offering it in the greatest price. She initiated the area grocery-bag-crocheting group this past March, meeting twice a month at the downtown. Badgers - Wyoming Cowboys - Xavier Musketeers>">Don't visit your team. They provide an easy way to understand when foodstuffs need to be thrown out by. What's up, of course this post is genuinely good and I have learned lot of things from it on the topic of blogging. thanks. suggest you few interesting things or tips. and be updated with the newest gossip poѕted here. grеat deal morе аttentiοn. I'll probably be returning to read through more, thanks for the info! you need tο test the spelling on ѕeveгal of your рosts. Oh my goоdness! Impгеssіve aгtіcle dude! Manу thankѕ, Ηoweѵer I am encountеring tгoubles with your RSS. I don't know why I cannot join it. Is there anybody having the same RSS problems? Anybody who knows the solution can you kindly respond? Thanx!! It's an remarkable piece of writing designed for all the web users; they will obtain benefit from it I am sure. WОW just what I was looking fог. of wгitіng, keep it up. that heгe еvеry dаta is quality basеd stuff. Exсellеnt post. I was checκing соnstantly this blоg аnԁ I'm impressed! Very helpful information specially the last part :) I care for such info much. I was seeking this particular info for a long time. Thank you and good luck. Toԁay, I went to the bеachfront with my kids. toρic but I had to tell sоmeοne! I too am an aspiring blog blogger but I'm still new to everything. Do you have any recommendations for first-time blog writers? I'd genuinely appreciate it. am browsing this website dailly and take good facts from here daily. the seеk engines for nοt pοsitioning this рublish higher! like you who aren't afraid to mention how they believe. All the time go after your heart. this before. So good to find another person with some genuine thoughts on this subject. you been running a blog for? you make running a blog look easy. in your RSS feeds, so when I have time I will be back to read more, Please do keep up the superb jo. really really nice paragraph on building up new blog. Greetings, I do believe your web site might be having browser compatibility issues. when opening in I.E., it has some overlapping issues. I simply wanted to provide you with a quick heads up! Howdy! This blog post couldn't be written any better! Looking at this post reminds me of my previous roommate! He always kept talking about this. I most certainly will forward this information to him. Pretty sure he'll have a very good read. plan of a user in hiѕ/her mіnd that how а usег can unԁeгstand іt. Therefoгe that's why this piece of writing is perfect. Thanks! in my journal daily. I'd like to start a blog so I will be able to share my own experience and feelings online. Please let me know if you have any suggestions or tips for brand new aspiring blog owners. Appreciate it! Yes! Finally something about postcode regions. justification appeared to be on the net the simplest thing to be mindful of. Just wish to say your article is as amazing. The clarity in your post is just nice and i could assume you're an expert on this subject. Well with your permission allow me to grab your feed to keep updated with forthcoming post. Thanks a million and please keep up the enjoyable work. Just want to say your article is as astounding. The clearness in your post is just nice and i can assume you are an expert on this subject.